Ellis Skolfield, before his death in 2015, requested that all of his books and other material be made available to the public at no charge. This site has all of his books, writings and other material available for download in PDF format. Please click the appropriate menu. Given below is an introductory letter written by Mr. Skolfield. Our traditional views don’t fit reality anymore! But accepting doctrinal reform has never been easy for the Church. Over the years, I’ve visited many Christian chat-rooms, hundreds of churches and even taught in a few. Many of those churches have leaders who claim to be Bible prophecy experts. It isn’t so. They are actually “ism” experts: Preter-ism, Dispensational-ism Histori-cism or some other “ism.” And it’s a tragedy! Those "isms" have slammed the door on outside-the-box studies in Bible prophecy for over 300 years!!! As a result, when God in His time removed the veil from His prophetic books, no one was watching. I’m reminded of one church leader who typifies the problem. When I met this ism-ite, he was bubbling over with the usual gossip about who the Antichrist might be, when the tribulation was going to start and whether there was going to be a pre, post or mid trib rapture. I asked if we could go to a blackboard. There we opened our Bibles and read . . .
"Of course, that’s common knowledge," he replies, smiling. "Ummm -- sure," he says this a bit faintly; he probably knows where I’m headed. "Are you saying that trumpets will be blown after the last trumpet? Isn’t that contradicting a plain statement of Scripture? believe?" I’m hiding a smile. trumpets and seals take place during the Seven-Year Tribulation. Everyone knows that." of exegetical slight-of-hand brought your denomination to that conclusion?" You see the problem don’t you? Despite its irrationality, this pastor couldn’t abandon his tradition. Now I don’t doubt for a moment that this dear man was doing the best he could, but like most Church leaders, regardless of stripe, he could only see the Bible through his doctrinal filter. But if the Bible is really the Word of God, we ought to believe what it says, whether it fits our doctrinal filters or not! Some time later, and in a different church, I used a blackboard to graph the prophetic days. I showed this pastor how Daniel predicted the coming of Islam 1200 years before Muhammad was born. I showed him how Revelation predicted the first Islamic Jihad, the Crusades, the birth of new Israel in 1948 and Jerusalem again under Jewish control in 1967. I graphed those fulfilled prophecies so clearly they were virtually impossible to dispute. From the way he responded, you’d have thought I’d just shot his favorite bird dog. Then he started screaming at me, and I do mean screaming: "YOU’RE DOING AWAY WITH THE TRIBULATION !!!" I’d just threatened his end-time traditions and he was beyond reason. Though he was the loudest example of the problem, unique he wasn’t. Thankfully there were a few pastors out there with open hearts or I would not have been able to go on. Some years later, I chatted with a Christian author who had just written a major book on Bible prophecy. Thinking he might be interested, I showed him how most of the prophetic days had already been fulfilled in new Israel. It seems that prophetic days didn’t fit his scheme of things and certainly not his book, so he disagreed. Even after showing irrefutable scripture (Ezekiel 4:5-6) and historic support for the prophetic days, he kept on with his, "There’s no such thing as prophetic days." Then I said, "But you now have me convinced. I won't believe in prophetic days anymore. From now on, I'll believe in ‘widgets’, because those ‘widgets’ fit scripture and recorded history right to the year." Jim was not amused, sad to say, but no matter how well presented, Jim still couldn’t hear truths that didn’t fit his prior doctrine, even when you could positively prove them to him. The above accounts may sound a bit humorous, but they really aren’t. No blindness is as profoundly dark as the blindness one inflicts upon himself, and the Church is not immune to it. Jesus faced the same problem with the Pharisees of His day. He addressed it by saying, "By your traditions you make the word of God to no effect." Popular end-time traditions of today are also making the word of God to no effect. God is truth, and how well we serve Him is not determined by how artful we are at defending our favorite doctrines, but on our willingness to seek out and follow the truth. I’ve pretty much given up on the established churches. There are a few open-hearted pastors out there, but not many. 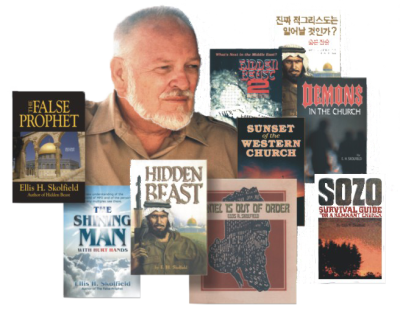 Over the past 20 years, I’ve written five books on Bible prophecy, none of which has been scripturally refuted by anyone. Those books are either true and of the Holy Spirit or they’re not. That’s for you to decide. But if they are of God, they will change your life and ministry just like they changed my life and ministry and the lives of all those who have read them with an open heart.